The quick menu is now more user friendly. Creating, joining, and other party features are even easier to access. When using Remote Play on a Windows® PC, Mac, Xperia™ Smartphone, or Xperia™ Tablet, you can now use your device’s microphone for voice chat in games or in parties. You can now use screenshots to customize the background of your home screen and function screen. Select(Settings) > [Themes] > [Select Theme] > [Custom]. You can now post screenshots directly to activities, such as those shown in [What’s New]. Press the SHARE button, select [Screenshot], and then select [Activities] as the upload destination.Also, you can now tag games and fellow players. Your status is now visible as(Mobile) when you sign in to an application such as(PlayStation App), even when you are away from your PS4 system. This means you are available to communicate with Friends. You can now make a party public or private even after the party has been created. Select(Party) > [Party Settings] > [Party Privacy]. You can now upload or download saved data right from the home screen. Press the OPTIONS button, and then select [Upload/Download Saved Data]. You can now launch(SHAREfactory) right from(Capture Gallery). Press the OPTIONS button while viewing(Capture Gallery), and then select [Edit in SHAREfactory]. You can now change the color of your profile screen to match the cover image. On your profile screen, select(Options) > [Change Cover Image] > [Change Background Color]. The design of(PS4 Remote Play) for Xperia™ has been updated. When you receive a partyinvitation, you can now respond from(Messages) or(PS Messages) with a quick reply. Your profile screen cover image on your PS4 system is now displayed in(PS Messages). Cinematic mode image quality on PlayStation VR has been improved. * Windows is either a registered trademark or trademark of Microsoft Corporation in the United States and/or other countries. Mac is a registered trademark of Apple Inc. in the United States and other countries. “Xperia™” is a trademark or registered trademark of Sony Mobile Communications AB. “Blu-ray 3D™” is a trademark of the Blu-ray Disc Association. [Update 1] Although it seemed that Sony would release the PS4 4.50 update yesterday, the official @AskPlaystation Twitter account has stated that they don’t have an official release date for the firmware update just yet. [Original story] The PlayStation 4 4.50 firmware update is allegedly being released tomorrow, and is said to include a firmware update for PSVR as well. The rumor originates from a PSVR subreddit user, who claims to have received an e-mail from PlayStation support. 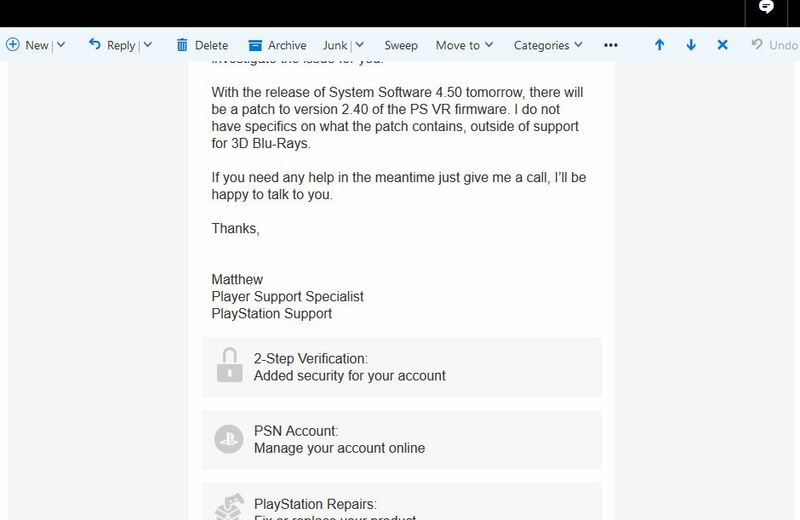 In his e-mail, reddit user ‘Finch-Tech’ asked about PSVR image drift problems, after which PlayStation support apparently confirmed the release of the PS4 firmware update tomorrow. “With the release of System Software 4.50 tomorrow, there will be a patch to version 2.40 of the PS VR firmware. I do not have specifics on what the patch contains, outside of support for 3D Blu-Rays.”, the e-mail from PlayStation support reads. Sony detailed the upcoming PS4 4.50 update, codenamed Sasuke, last month. The update will offer custom wallpapers, external HDD support, 3D Blu-Rays on PSVR, a simplified notification list, and more. The 4.50 firmware update will also introduce a ‘Boost mode’ for PS4 Pro owners, which offers substantial performance improvements for unpatched PS4 Pro games. Judging from early tests, Boost Mode can increase performance by up to 38% for some titles. If the e-mail mentioned above is legit, expect Sony to make an official announcement within the next few hours.